Today this post is about, well, just what the title implies. I've been meaning to say thanks to the Little Paper Shop for the lovely stamp set I received as a winner of their sketch challenges from a couple of weeks ago. This little beauty of a stamp set was in my mailbox just the other day. I can see so many uses for this set from Christmas to Sympathy cards. Unfotunately, I'll not have a lot of time to play until after next week. There are still major family goings-on this week. Andrew & Sheena return from their honeymoon tomorrow, Tuesday is a big dinner which I'm cooking and, sadly, Thursday, Kirsten, John, Owen and James return to England. I have had so much fun just watching the grandchildren over the past couple of weeks and yesterday, well, Owen spent the day with us. However, when it was bedtime he wanted Mommy and Daddy. I can't say I blame him because it's tough being two and being on vacation. Nothing is normal for their little minds, but that's okay. We'll have more fun on Tuesday. Here's one of my favourite pics from yesterday. 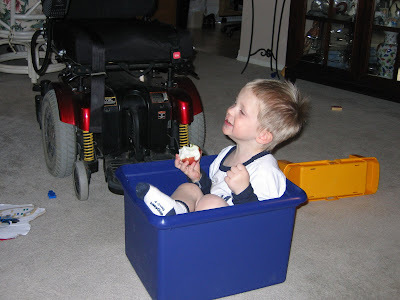 He had emptied out the toy box and decided it would make a good chair for TV watching. I think he was watching Stuart Little when this was taken. Something certainly made him chuckle. Next up is a site I just happened upon this morning. 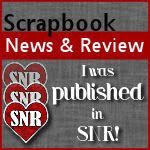 I love using Photoshop for scrapbooking and Jessica Sprague has what appear to be great classes on how to use Photoshop, both Elements and CS3. Currently there is a free class on offer and I've signed up for it. Here's the flyer from her website. 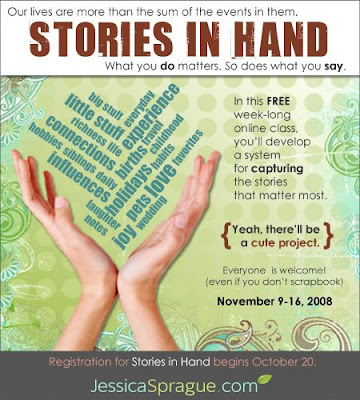 The class begins November 9th, so there's plenty of time to register. Maybe I'll see you there. 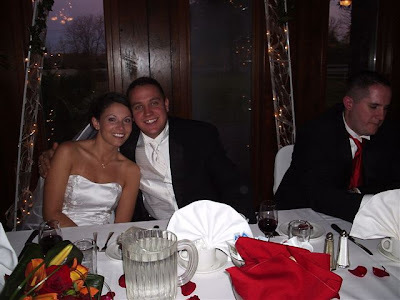 Introducing Sheena and Andrew Collier. Just off to the right of the photo is my youngest son, Phil. He'd be annoyed if I forgot to mention him. The day was beautiful, the sky was blue, the sun was shining and all was right with the world. It was a tad chilly, but nothing we couldn't handle. The newlyweds are currently relaxing in Montego Bay, Jamaica and will return on Monday. Here's a few other pics from the wedding and reception. You may notice me dancing with Andrew. My knees work beautifully. I even got to boogie through a couple of tunes. When the professional photos are ready, I'll post a few more. Well, it’s me again; GrampaStamper. As you probably know, we’ve moved from beautiful Thunder Bay to beautiful Guelph; from the country to the city; from deer crossing the yard to grandkids crossing the carpet. All in all, pretty good. I have my 30 square feet of space for my computer and Barb has her 300 square feet for crafts. As anyone who goes back in this blog can see, Barb has come a long way in creating cards, both in creativity and technique, but, and there is always a but, her spatial awareness still needs some work. 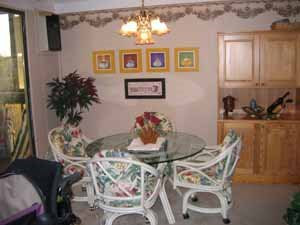 Exhibit “A”: This is our dining area. 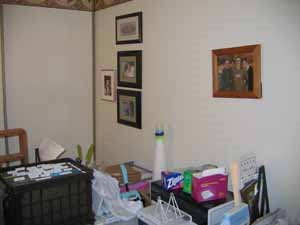 It’s not a separate room; just an area off the main living room. Note the elemental balance, the masterful use of colour, the tonal subtlety. You guessed it: I arranged this. I have no idea how she reached the required height of the top one, near the left of the picture, but it has a verse that I think only passing seagulls can read. The picture of our kids, by itself on the right, is noticeably listing starboard, perhaps to evoke fond memories from our time in the Maritimes but more likely she couldn’t offset the weight of the stand the frame was built with. So, friends, while we celebrate this Thanksgiving here in Canada, I am especially thankful for the fact that, although close, she’s not perfect. For imperfections foster growth and growth fosters a deeper relationship. And besides, she’s fun to tease. 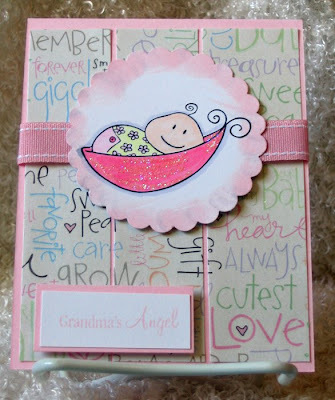 This is my entry for the second challenge at the Little Paper Shop Blog. 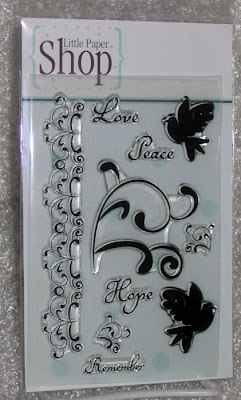 I think this sketch is terrific and I knew just the stamp set to use for it. All the stamps used in this card are from LPS. 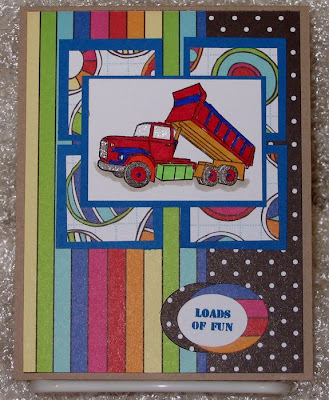 The DP is by Scenicroute and works perfectly for a card for a toddler who loves construction equipment. Of course, I used my Copic markers to colour the image, with a little bit of the Copic Spica pens for glitter on the windshield and chrome on the truck. Please take a wander over to LPS and check out their stuff. I really like what I see and I'm sure you will too. I need challenges to rekindle my creative spirit! Sadly, I have been in a creative funk for what feels like a very long time. In fact, it's only been about 2-1/2 weeks, but for what I have invested in this hobby, it's way too long. Just ask DH! Anyhoo, I couldn't resist getting into the fray with all of the challenges abounding for World Card Making Day yesterday. At The Stamp Shack, there was nothing formal planned, just those who wanted to create a challenge did so. 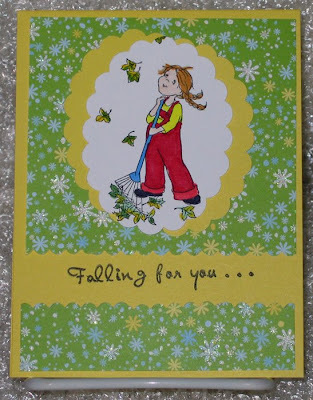 My friend & roomie for Shackie get-aways, Sherri, posted a challenge to make a Fall card without using orange or brown! I did and here it is. Isn't she a sweetie? She's from Paper Pretties and was the September Stamp of the Month and here I am, just getting around to her now. It was very simple to make and I felt it didn't need any embellishments because of the scalloped edge of the paper layers. I cut it with a pair of decorative scissors. Also, the use of the Giga Scalloped Punch added to the look. The DP is from DCWV Glitter Stack. I'm just going to the Little Paper Shop blog now to put in my entry for the blog candy associated with this Sketch Challenge. Why don't you hop on over there, too, and participate in some of their challenges.